He is one of the most experimental winemakers in Nierstein, and stands out in this village that isn’t quite lacking winemaking talents. Kai makes no compromises when it comes to quality, but at the same time isn’t afraid of taking risks and trying out new things. For the 2012 vintage for example, he teamed up with young winemaker Katharina Wechsler from Westhofen to create a Riesling cuvée of each of their best vineyards. Pettenthal and Kirchspiel. The result named “Pettenspiel” is a bone dry, fresh and mineral wine, somehow demasking the single vineyard ideology and showing that there are no boundaries to quality winemaking, even in the so-traditional Germany. But of course he also makes a genuine single vineyard wine out of his Pettenthal parcel. Pettenthal is one of the steepest parts of the Roter Hang and also closest to the Rhine river which, for this strip, nearly flows parallel to the vineyards. The moderate Southern exposure and proximity to the Rhine account for the particular micro-climate of the location. The red slate soils are rocky and vines have to grow deep roots which results in complex and spicy wines. The quality of the vineyard is such, that even winemakers from further away villages are eager to hold stakes. Only a couple of years back, winemaking superstar Klaus-Peter Keller bought himself into this area, which is about 30 kilometers away from his own estate and flagship vineyards. Quite a knightly accolade for the terroir quality. But of course, there are also many local owners with high reputation: Kühling-Gillot, St. Antony, Gunderloch to name a few. But what is even more interesting: all of these winemakers have slightly different interpretations of the vineyard. A lot of the produced dry Rieslings are on the bold side, with alcohol levels sometimes surpassing 13,5%. Let’s see what Kai Schätzel’s 2010 Riesling is like. This 2010 Pettenthal I have in my glass has a color leaning towards a light gold. In the nose it already shows a hint of evolution with a touch of petrol, which is probably due to my relatively warm cellar (I had the same wine a few months back at the estate and it was as fresh as the morning dew), but it also shows the typical herbs aroma and spice of the iron-rich soil of the vineyard. And of course, there is loads of clean and bright Riesling fruit coming through as well. On the palate, the wine displays a zen harmony: acidity and fruit are present in perfect proportions. It seems to have weight in flavor, but foremost depicts a clear style of lightness. The back palate is experiencing an explosion of herbs-infused minerality. The wine appears dry to me, but some others tasting it mentioned a slight sweetness, which doesn’t surprise me, as Kai is a fervent defender of Kabinett-style wines. But again, it is about the balance. The acidity is so well-dosed that the frankly very abundant Riesling fruit couldn’t be transmitted in a brighter way. There’s lots of freshness and some grip, also with some notes of grapefruit jumping in at the end to complete the flavor-spectrum. 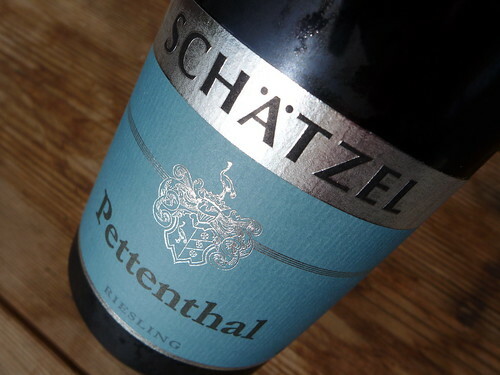 This 2010 is a great Pettenthal which – by the way – only displays a very light 12% alcohol on the label. It is a filigree and elegant interpretation of the vineyard, but at the same time a straightforward wine with freshness and determination. Somehow Kai Schätzel is redefining great growth dry Riesling. How is it possible to put so much flavor in a wine with such lightness and low alcohol? There’s definitely much more to come. This year the critics of Gault Millault wine guide finally aknowledged the quality of his wines, giving 91 points to his 2013 Pettenthal. Still to few. Clever Riesling fans should go buy these wines now! The monthly commission charged in addition to fixed interest.